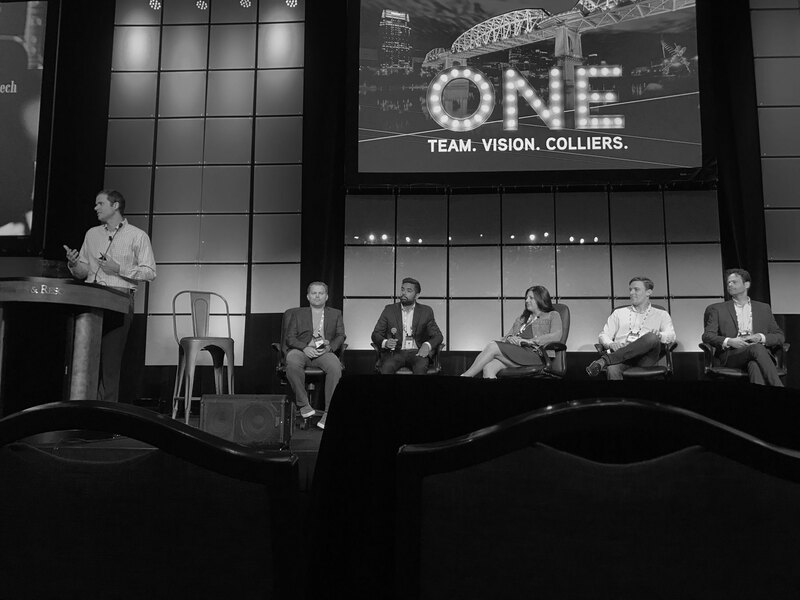 BlockVue recently partnered with Colliers International to sponsor their 2018 US Marketing & Research Conference, a 2-day conference held in Nashville, Tennessee. William Granruth, the CEO of BlockVue, was invited to participate in a panel discussion about cutting-edge technologies—such as AI, Blockchain, Automation, Chatbots, Smart Building Technology, and Prop-Tech Start-Ups—and how they will impact the future of commercial real estate (CRE). Granruth was joined by 4 other panelists to celebrate the best and brightest in PropTech: Nik Pai, the Head of Analytics at Hootsuite; Danny Shachar, the Vice President of CompStak; Jack Weiss, the Director of Cosmos Communications/IMP; and Michele Horowitz, the Senior Enterprise Relationship Manager at LinkedIn. Below is a brief description of each individual company represented on the panel and what each company is doing in terms of data analytics (BlockVue, Salesforce, LinkedIn), AI (LinkedIn, Compstak), and marketing automation (LinkedIn, Hootsuite, and Cosmos). Building a platform to provide commercial real estate professionals with descriptive analytics (summary of historical data to yield useful information and possibly prepare the data for further analysis – why was a building leased?) and prescriptive analytics ( what will happen in the future, how will firms benefit from the predictions, how will those decisions impact other aspects of CRE). CompStak gathers leasing and sales comps from the CRE firms/ professionals making deals so you can focus on meaningful networking, accurate analyses, and closing business. Trying to build a CRM platform to visualize every piece of valuable data in one screen using sensors and analytics to provide meaningful insights on building use and efficiency. Using data analytics and AI to provide meaningful and effective suggestion to build a person's professional network. Enables organizations to drive more effective marketing campaigns by giving them tangible insight into the ROI of their paid, earned and owned social campaigns. Developed IMPGO "Our platform has been developed to streamline the marketing process by bringing together your critical data, creative brand identity and marketing communications under all one roof." As our CEO, William Granruth stated during the discussion, "Investments in real estate tech have gone from under 1 billion [dollars] to above 12 billion [dollars] in under five years." Recognizing that many people find it hard to conceive this amount of money, William went on to explain that, "Sometimes it's hard to conceptualize how large 1 billion is… To put it in easier terms to understand, 1 million seconds is about 11 days and 1 billion seconds is about 31 years." Thank you to everyone at Colliers International for making the 2018 US Marketing & Research Conference possible and inviting us to participate. To learn more about what we do at BlockVue, please check out our website and do not hesitate to contact us.